Pacific Island countries are spread across millions of square kilometers of the Pacific Ocean and support a wide range of terrestrial and marine ecosystems. Rapid population growth, urban developments, poverty, deforestation, and land degradation are some of the human-induced threats to the natural resources in these Pacific islands and without proper management of these limited and threatened natural resources, the islands would not be able to sustain the resource demands of a growing population. Remotely sensed data play an important role in the sustainable management of natural resources. Remote sensing (RS) refers to the science and technologies of obtaining information about objects or areas at far away (remote) places by scanning the earth from a distance such as aircrafts or satellites. Land use, land cover, protected areas and species habitats are some of the aspects of the environment that can be monitored using remote sensing. The EWC summer travel grant assisted me with the costs while I was doing my summer internship at the Secretariat of the Pacific Community Applied Geoscience and Technical Division (SOPAC). They are currently carrying out one of the largest GIS/RS projects in the Pacific which involves developing a unique database which can be used by anyone interested in carrying out work in the terrestrial and marine sector in the Pacific. I interned with the GIS/RS department. 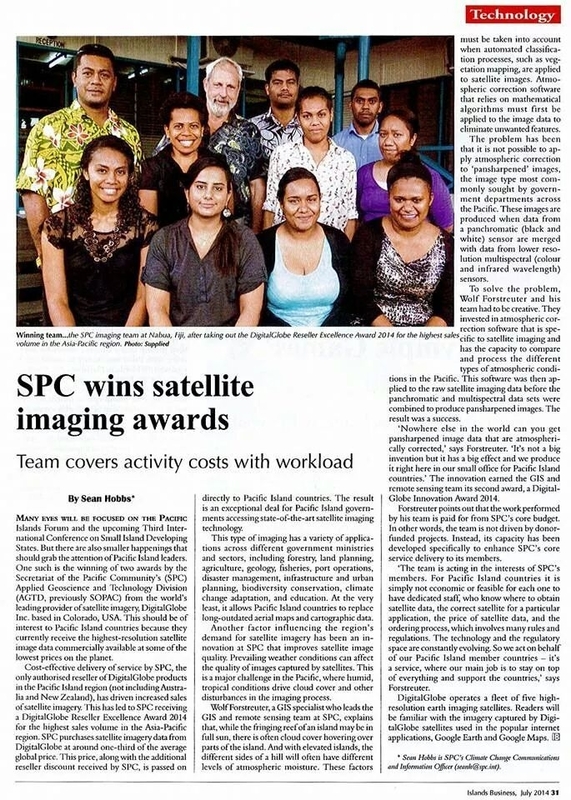 For the first few weeks I was with the preprocessing division where I was involved in preprocessing all the satellite images that were to be used by SOPAC, other NGO’s/organizations and researchers. I was fortunate to be part of the team that won 2 awards by the world’s leading satellite image provider DigitalGlobe.Inc. SOPAC with its cost effective delivery of service won the DigitalGlobe Reseller Excellence Award 2014 for the highest sale volume in the Asia-Pacific region. The remaining weeks I worked on a land cover change detection project on Abemama which is an atoll in the Gilbert groups in Kiribati. I was involved in digitizing the map from 1970’s so that it can be compared with the current satellite imagery to detect and analyze land cover changes. Apart from the experience I gained in such an amazing organization, I had the chance to network with GIS/RS professionals from other organizations which was very interesting and it also opened doors to some work opportunities that I would have when I return to Fiji in Dec 2014. Thanks again EWC for the travel grant. ← 2014 Summer Travel Grant Series: Presenting at the School of Social Sciences and Humanities Workshop at the University of Tampere, Finland.